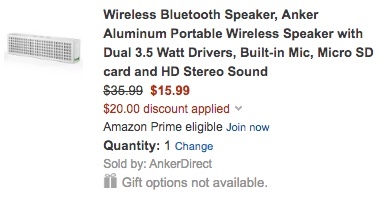 Anker Direct via Amazon offers the Anker Aluminum Bluetooth Speaker for $35.99, but when you use the coupon code WOWDEALA the price drops to $15.99 Prime shipped. That’s $20 off the regular sale price and the lowest we’ve seen it offered at Amazon. The speaker has an 8 hour battery, delivers HD sound and with a built in mic you can take handsfree calls. Rated 4.3/5 stars by 38 Amazon shoppers. 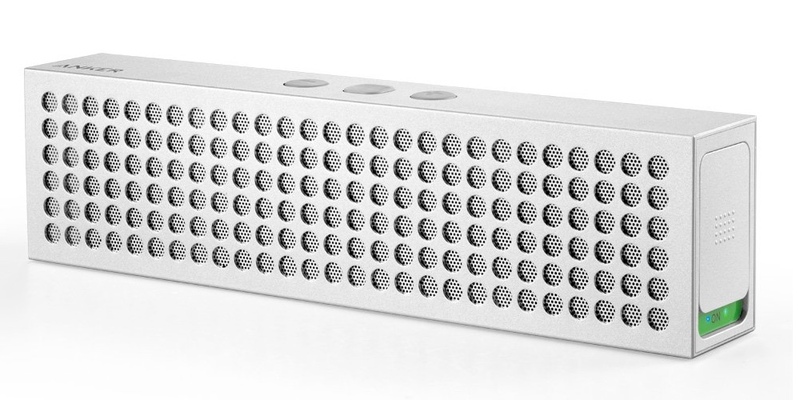 Anker Aluminum Bluetooth Speaker A portable speaker that looks as good as it sounds. Sleek & Polished An aluminum shell gives a premium look and feel to your premium portable speakers. Stereo Sound With two powerful 3.5 watt drivers built in, the Anker Aluminum Speakers pump out fantastic audio. You’ll be surprised by its clear, full sound. 8 Hour Playtime Listen non-stop for up to eight hours on a single three-hour charge. Perfect for parties or trips. Free Up Your Device Answer calls or control your music at the press of a button. You can also insert a Micro SD card (supports MicroSD up to 32GB, not limited to FAT32), so even if your phone dies, the music continues.